Sanchay is responsive WordPress themes for modern online magazines, professional blogs and other editorial websites. This theme is fast, secure and perfectly suitable for topics like food, lifestyle, fashion, sports, gadgets, travel, international news, politics, or anything else. The theme is fully responsive, which means your website will look great on all devices and screen sizes. Themes follow the best internalization practices and therefore are ready to be translated into your language. There are a couple of languages written and read from right to left (RTL) direction like Arabic, Hebrew, and others. The theme is also ready for use with all RTL languages. 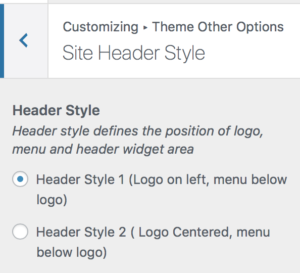 User can select site’s header style of their choice from two available header styles choices. Depending on the user choice site’s logo and site’s navigation menu will be positioned. User can also upload images of their choice for site logo and site background. User can choose any font of their choice from more than 800+ Google Fonts for the heading and body text. Sanchay supports multiple post types. With Sanchay you can create a content-rich blog and apply custom styling for articles, galleries, quotes, videos, and audio clips. 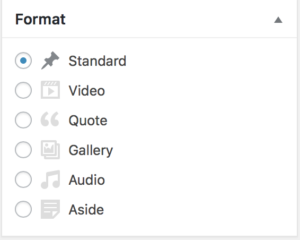 The theme supports Standard, Gallery, Video, Audio and Quote post Formats. 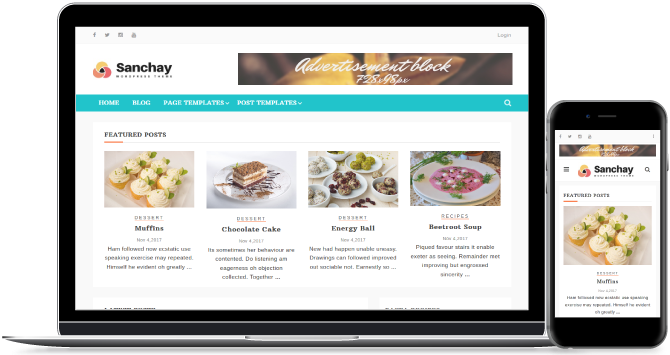 Sanchay allows user to choose from a selection of pre-made page and post templates to build their site. 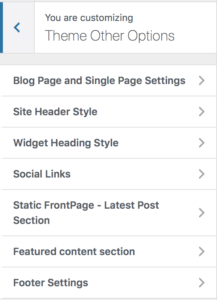 Available post and page templates are: Default, Left-Sidebar, Right-Sidebar and Without Sidebar. Sanchay comes with custom category widget to showcase any number of categorized posts. The widget also provides options to display posts in different layouts like grid, list and many more. Sanchay comes with 10 site wide widget areas that you can use to display advertisements and insert content of your choice. 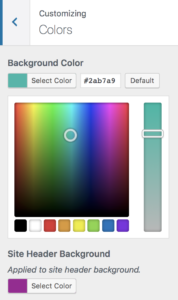 Sanchay has easy to customize theme options. With these customization options user can change look and feel of the site. User can customize site header, blog post layouts and details, site’s front page content and site footer. 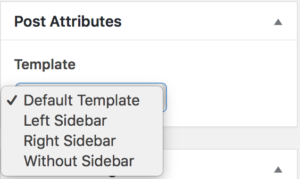 User can select position of sidebar from three different ¬†positions: Left, Right or No sidebar. 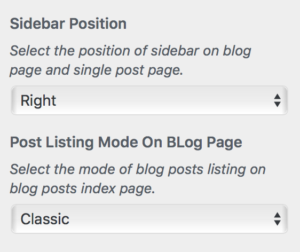 User can also select blog layout from three different layouts: Classic, Masonry and List. 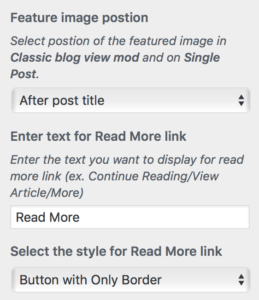 The theme option for blog posts page allows user fix the position of featured image and also allows user to set custom text and style for read more text link on blog listing page. Sanchay has theme options to show/hide post meta. User can hide/show post author name, author Gravatar image, post date, post comments link and post category link. 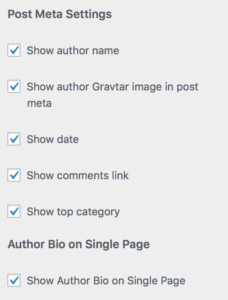 User also has an option to show/hide Author Detail Description box on single post page. Sanchay gives the user 13 different style option for Widget Headings. The selected style applies to widget title/heading. Sanchay makes it super easy to showcase your best content to your visitors with a stunning Featured Content Carousel. Showcase up to 10 of your featured posts in an elegant, responsive carousel at the top of your homepage. 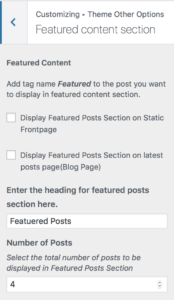 Simply add a #featured tag to your posts and it will be included in the carousel automatically. 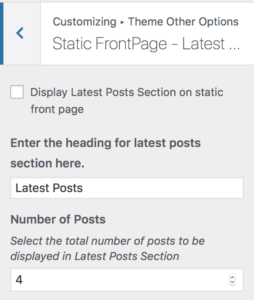 User can choose to add latest post section to display recently published posts carousel on the static front page. 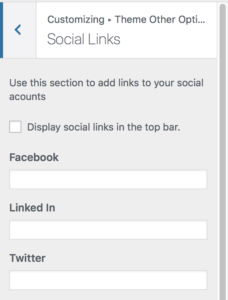 Using this theme option user can add links to his social accounts like Facebook, Twitter, Instagram and many more. 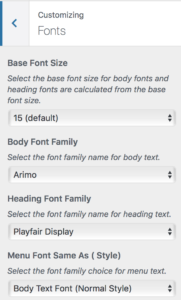 User can customize the text displayed in footer section. 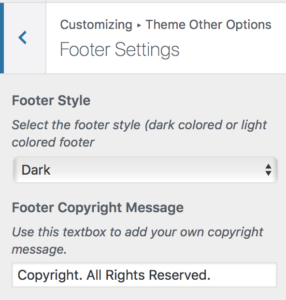 The theme also provides user with two footer styling options: Dark Color Footer and Light Color Footer.